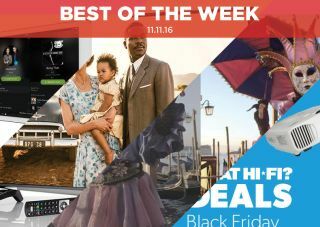 Best of the Week: Spotify, budget Finux 4K TV, YouTube gets HDR and more | What Hi-Fi? A round-up of all the main highlights from What Hi-Fi? this week, including news of "better" sounding vinyl, as well as a review of a budget 4K TV and new headphones from B&W. This week, Dutch company Symcon revealed plans to manufacture vinyl that sounds better than current records, Atlas is selling a cable for £1500 and YouTube has begun the rollout of its HDR update. Elsewhere we have plenty of reviews to tide you over the weekend, with another look at music streaming behemoth, Spotify, B&W's P3 Series 2 headphones and Finlux's 48UXE304B-P 4K TV. MORE: Black Friday 2016 – When is it? Where are the best deals? Dutch company Symcon has claimed that it can not only manufacture vinyl faster than before, but produce better sounding records. This new process, called "injection moulding", injects plastic into a grooved mould. It is claimed that this will lead to a more accurate press. But before you whip out your wallet, the company has just been given a grant to develop the technology and hasn't actually made any vinyl records yet. Christmas has arrived early for audiophiles, and it could be a very expensive one if you like hi-fi cables. Atlas has released the Mavros Ultra SE interconnect, which costs £1500. For those happy to splash the cash, the Mavros features goldplated Ultra RCA plugs and is made out of a material that aims to both reduce corrosion and offers a lower electrical resistance. However, you had better be quick. Only 50 are being made. YouTube is rolling out its HDR update, so you'll be able to watch HDR content via Chromecast Ultra and HDR compatible TVs. The company has confirmed that 2016 SUHD and UHD TVs from Samsung will receive the update this year. It hasn't been confirmed when it will appear on other TV ranges yet. Black Friday 2016: When is it? Where are the best deals? "Spotify is the mass market choice for those interested in discovering old and new music"
With tough competition from the likes of Apple Music, Spotify has constantly had to react and innovate in order to keep ahead of its rivals. The Swedish streaming service has upped its game in the music discovery stakes, making it easier to find music both old and new. While audio quality hasn't improved, the breadth of options and consistency of performance across devices makes Spotify tough to beat. "There’s no question they offer an improvement over the P3s in some areas"
You'd normally expect a pair of B&W headphones to reach a premium price. With the P3 Series 2, B&W has come up with one of its most affordable on-ears yet. They offer a better listen than the originals, and are both portable and durable. However, their easy-going nature goes against them, as they lack the attack of their rivals. "It has a nice 4K picture on a 48in screen, with fair sound to match and a decent selection of streaming services"
A 4K TV for £500? Surely not! Yet this Finlux makes a good case for Ultra HD on a budget. The TV comes with Finlux's Smart Hub, granting access to Netflix and other on-demand services. The picture is rather nice, with a good sense of detail and motion-handling. At this price, the lack of HDR is not too surprising, but still disappointing. Ease of use could be improved too, but otherwise, this is a fine effort.